Better health, longer lives and less physically demanding jobs have prompted people to work longer. That’s good news for Baby Boomers who both long to work and have to work. But it’s not good news for younger generations, a USA TODAY analysis finds. 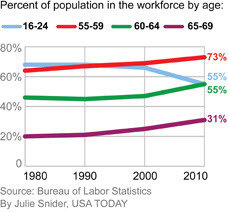 The number of people 55 and older holding jobs is on track to hit a record 28 million in 2010. People in their 50s, 60s or 70s are staying employed longer than at any time on record. For example, 55% of people ages 60 to 64 were in the labor market during the first 11 months of 2010, up from 47% for the same period in 2000. With job creation creeping along, young people increasingly are squeezed out of the labor market. The portion of people ages 16-24 in the labor market is at the lowest level since the government began keeping track in 1948, falling from 66% in 2000 to 55% this year. There are 17 million in that age group who are employed, the fewest since 1971 when the population was much smaller.